Bhatkal: July 6, 2015: Terror group Indian Mujahideen (IM) founder Yasin Bhatkal’s mother Rihana Siddibapa has expressed fears that the police might bump off her son in an "encounter". This comes in the wake of reports that Yasin told his wife over the phone about his escape plans from the jail. He reportedly told his wife that he was receiving help from Damascus which had triggered fears about the jailed jihadi getting help from Islamic State. "That my son is planning to escape to Syria is a conspiracy of the police. It is a pack of lies. It is true that he (Yasin) spoke to his wife and me over the phone. But he never said anything about escaping to Syria. 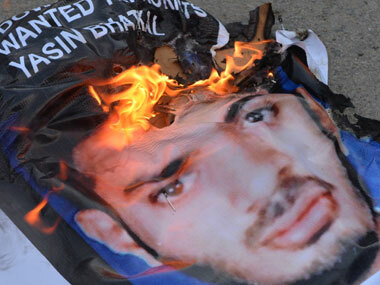 They are just trying to frame my son," she told the media in Bhatkal, coastal town of Karnataka. Though the Telangana state (where Yasin is in jail) officials clarified that Yasin Bhatkal had spoken to his family members over phone after the necessary approvals from the authorities concerned, Rihana said they were worried about his security now. "But we fear for his life. We sense that there is something worse waiting to happen. First they said that he is planning to escape to Syria. What if he is killed in an encounter to make it look as if it happened when he tried to escape from the jail? My son had told me in the past on several occasions that the police might kill him in an encounter," she said. Pointing out that Yasin was housed in a high-security cell, Rihana said it was impossible for him to escape from that jail. "He told me that he has been falsely implicated in the case (terror-related). There is insufficient evidence to prove the charges against him. We all are worried for him," she added. According to her, the leaked information that Yasin was planning to escape to Syria was part of a greater conspiracy. "We should not be shocked in future if we learn that police kill him while escaping from the jail. We have reached that stage," Rihana lamented. Yasin has a wife and nine-year-old child, who are staying with his parents in Bhatkal. He has not met them since 2007 after he disappeared from Dubai. The root of terrorism has to be destroyed from India.These terrorist do not have value for others n why should we pity for them.These people should be killed in encounter. He has spoiled the name of Bhatkal, All the people who hails from Bhatkal are being framed as terrorist.